Extinction Rebellion groups in 43 countries spread across six continents will participate in the International Rebellion beginning 15 April. News 15 April, 2019 . Written by Katie Donohoe. Starting on Monday, Rebels from climate action group Extinction Rebellion will take to the streets of cities all over the world – from Auckland to Accra, Mexico City to Vancouver – over multiple days to demand that governments take necessary action on the global climate and ecological emergency. Extinction Rebellion groups in 43 countries spread across six continents will participate in the International Rebellion beginning April 15. Rebels will be disrupting business as usual by occupying public spaces, blockading bridges, roads, harbours and transit systems, organising die-ins, cry-ins, funerals, banner drops, ‘blood’ spilling, art and theatre. The International Rebellion aims to force governments to agree to Extinction Rebellions core demands to tell the truth about the Climate and Ecological Emergency and enact the necessary measures to address it. In London, thousands of people will gather in the capital’s four busiest, most iconic locations – Marble Arch, Oxford Circus, Waterloo Bridge and Parliament Square to peacefully block traffic around the clock. There will be a full-scale festival of collective action and creative resistance with people’s assemblies, art actions, stage performances, talks, workshops, food and family spaces. On Friday, April 19 (Good Friday) Extinction Rebellion Ireland will join the full-scale International Rebellion to demand decisive action from governments on climate change and ecological collapse. Rebels will gather at The Spire in Dublin City Centre at 1 pm where they will have speakers and music highlighting the ecological and environmental crisis before proceeding towards O’Connell Bridge. Peaceful civil disobedience will take place. See their Facebook event for more information. 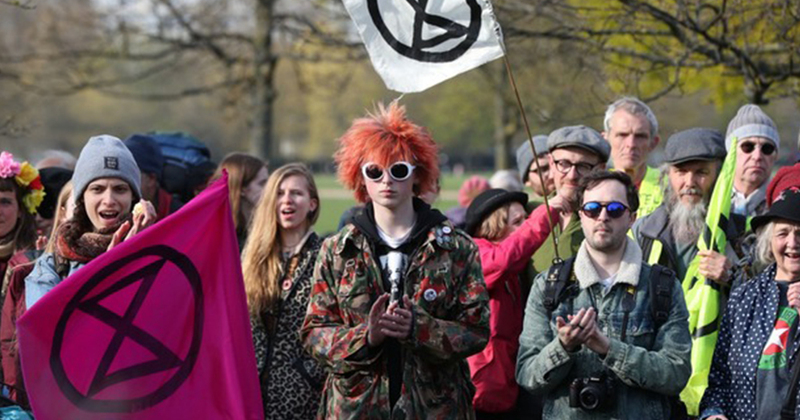 Extinction Rebellion’s International Week Of Action comes ahead of ‘Mayday’, an event co-hosted by Extinction Rebellion and GCN. Visit projectartscentre.ie to book tickets. 15 April, 2019 . Written by Katie Donohoe.